We offer four classes, grouped by age. 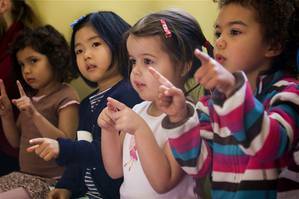 Most children move from one class to the next in sequence, although children may be eligible for more than one class. Our teachers are happy to discuss the best placement for your child. 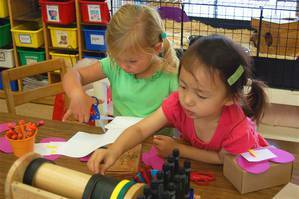 This Pre-Kindergarten class is such an important year for both the child and parent. Children continue to work on their social, emotional, physical, and intellectual skills which will get them ready for kindergarten. 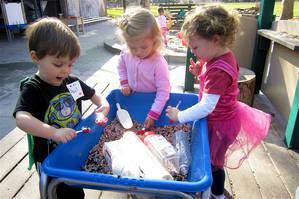 They build on their abilities to solve problems, make friends, engage in all kinds or art, science, gross and fine motor activities, field trips, and more. Parents get to continue their education in issues that are relevant to the pre-K child. The Preschool classroom promotes deeper learning by nurturing collaborative relationships; engaging family, community, peers and educators on the behalf of each child. The result is an inspired group, cultivating a more meaningful and intentional learning home for all involved. With emphasis placed on nurturing social, emotional, physical, and intellectual development, learning invitations spark curiosity, eager investigation, opportunities for growth, empowerment and mastery while divergently extending learning outcomes. The Young Preschool class provides a nurturing, supportive environment for families as their children experience the school environment independently, often for the first time. An inviting and multi-faceted learning space is created to stimulate play and self-directed learning, with a high ratio of adults to children. The parent education component helps to explore and advance understanding of the development of the children in our care and really supports the work we do in the classroom, as well as at home. This Parent-Child class is a wonderful introduction to nursery school for both the parent and child. 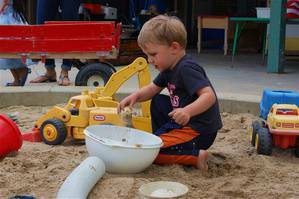 The child gets to play in a developmentally appropriate indoor/outdoor environment while learning social skills, engaging in art projects, music and story times. The parents get to meet other parents with children of similar ages, as well as get valuable parent education at our night meetings twice a month.